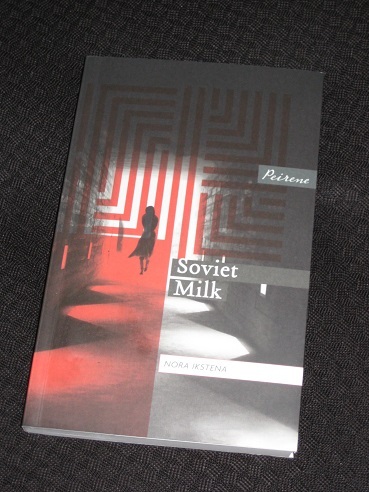 Nora Ikstena’s Soviet Milk (translated by Margita Gailitis, review copy courtesy of the publisher) is the story of two Latvian women and their lives under Soviet rule. The daughter, born at the very end of the 1960s, is an intelligent, level-headed girl, and her part of the story is an account of growing up in a situation that, while often constrained, is not without its joys. After spending her early years in Riga, she moves to the countryside for several years, and if she’s not always overly enthusiastic about her communist youth duties (such as hard labour in the fields), her days are usually happy ones. However, life is very different for her mother. Born towards the end of the Second World War, she grows up wanting to be a doctor, and her drive allows her to achieve her wish and work in the area of female fertility. This is the Soviet Union, though, and her unbending nature inevitably leads to conflict with authorities and a cruel punishment. For the daughter, the time in the Latvian countryside is merely a pleasant interlude in her young existence; for the mother, it spells the end of her dreams and a prison sentence she cannot hope to see revoked. Soviet Milk is told in alternating strands from the point of view of the two main characters. The mother’s voice is bitter and cynical, and as we learn how her life has turned out, we understand why. Her daughter is a far happier narrator for the most part, with her childhood a comfortable one (apart from when her mother’s depression overcomes her). However, once she becomes old enough to realise what’s happening outside her little world, she too begins to suffer, her experiences culminating in her despair at being forced to betray someone who has helped broaden her cultural horizons. The original title, Mātes piens, translates as ‘mother’s milk’, and this is an image running through the novel. The mother’s flight after the birth of her daughter, and her refusal to give her daughter her ‘bitter’ milk, sets the scene for later events (and even leads to the girl’s later aversion to milk). However, the title chosen for the English translation connects the literal mother’s milk with the allegorical version dispensed by the occupying regime. The liquid becomes a metaphor for the ideology the Latvians are expected to consume, one both women find hard to swallow. Gradually I got used to my new life, to my mother’s good and bad moments, and stays with my grandparents that were marked by sad farewells. I was still young, but I sensed that on the inside I was growing up. I was responsible for my mother. No one knew her light and dark sides better than I did. No one else stood ready to catch the next moment when she would want to leave her life behind. From a young age, it’s the daughter who cares for her mother, hoping to prevent her from spiralling into depression over her wasted life. She manages this surprisingly well, but with every day that passes, the time comes ever nearer when she’ll need to spread her wings and allow her mother to fend for herself. In the long hours of waiting outside my consultation room the women sometimes managed to bare their hearts to one another. It was all the fault of men, asking women to give up their child, or not allowing them to get pregnant. Yet men themselves were indifferent. They considered this part of the women’s world. And Soviet medicine would take care of them. The mother’s fatal slip comes when she attempts to confront this reality by attacking a man who treats his pregnant wife badly. While the reader is cheering her on, it proves to be her downfall and the catalyst for her exile to the countryside. Once a promising medical researcher, she is forced to become a country G.P. with no hope of ever returning to the city, or her career. The story is told through the two alternating monologues, often complementing each other, and Gailitis’ prose is never less than clear and compelling. While there are moments, particularly towards the middle of the book, where the story slows a little, the novel comes into its own when the daughter leaves her mother’s ‘cage’ and ventures out into the real world, only to find that it’s just as dangerous as her mother made out. The young woman’s years at high school bring new problems, and several encounters with authority, while back in the country her mother slowly falls apart without her daughter’s calming influence. Excellent review, Tony. I loved this book. It devastated me. All that thwarted potential and ambition. Agreed. I subscribe to Peirene and always look forward to receiving their books in the post. I have the full set from when they started, but have only read a handful. One day I will read them all! What a great and detailed review! So great to get your thoughts on this haunting novel and I like how you reflect on the novel’s ongoing political relevance. Thanks for this, Tony. Eric – Thanks 🙂 It’s a shame it didn’t make the MBIP longlist as it deserves a bit of publicity.